POKHARA, Jan 10: Gandaki Province is preparing to recommend the federal government to build petroleum storage facility in Tanahun district. The provincial government has proposed to build the facility with capacity to store 90 million liters of fuel at Gachhepani in the district. The preparation to build petroleum storage facility is finally taking shape, three years after the Chinese government expressed commitment to support Nepal to build petroleum storage facilities in different parts of the country. A committee formed by the provincial government under the leadership of Urmila Kafle has already submitted its report. It has suggested six areas to build the proposed facility. 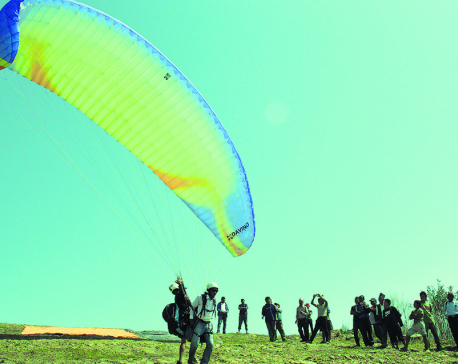 Gachhepani site, which has 200 ropani of public land, is at the top of the list. Girija Prasad Koirala Respiratory Center, public land near Markichowk, Palungtar and Gorakhkhali Rubber Industry. Although the provincial cabinet held informal discussion on the proposal on Wednesday, not decision has been taken yet. Ministry of Industry, Tourism and Environment is preparing to submit the proposal to the seven-members cabinet in the near future. The cabinet meeting will then decide on the issue. All issues related to commerce and supplies are being supervised by the Ministry of Industry, Tourism and Environment. “The committee has already submitted its proposal and the provincial government is studying it. The cabinet will take needful decision once the Ministry of Industry, Tourism and Environment tables the proposal in the cabinet,” Ram Sharan Basnet, the spokesperson for the provincial government, told Republica. He added that the storage facility will have the capacity of 90 million liters. “Storage should have capacity to store fuel needed for least three months. Construction process will begin soon after the site is decided," he added. Though the Chinese government has expressed commitment to build fuel storage facility, the provincial government has allocated Rs 1 million for the purpose. Minister for Industry, Tourism and Environment of Gandaki Province, Bikash Lamsal, has said that they will table the proposal in the next cabinet meeting, recommending Gachhepani site to build petroleum storage facility. During his China visit in April, 2015, Prime Minister Khadga Prasad Oli signed a 10-point agreement with China which includes Beijing's commitment to build petroleum storage facilities in different parts of the country.